← E-bikes—The Whats and Whys and Other Thoughts. Looking so very ordinary, the Ridekick E-trailer could change your outlook on cycling. Here is an idea for the ages. One smart person has come up with an idea as fresh as can be. I have to admit that I envisioned this well before I saw and heard of one, but that is a moot point. I have seen two styles of E-trailers, one by Pat, at San Diego Electric Bike, and this Ridekick. I will test Pat’s in the future, but today’s subject is this mass-produced Ridekick. This very well engineered and nice appearing E-trailer could be the answer many cyclists have been looking for. It is fully independent of the bike, so it can be used when needed, and requires no modifications to your standard, everyday bike. It will fit most bikes, so as long as the trailer hitch will bolt up to the rear axle, it can turn your cycle into an E-bike. This could be the perfect solution for a person who doesn’t have the funds or the space for two different bikes (an E-bike and a regular bike). My desire to test one has been burning, so I went on the Ridekick website to find my nearest dealer. They have it available in many shops, so the nearest one was not far away. Beach Bikes and Beyond here in San Diego generously offered me a chance to test one out. I spent some time with Nick getting the run-down on the specs and operation, and I was on my way. As luck would have it, their shop has a very hilly neighborhood just east of their location. So off I went on this cool contraption called an E-trailer. Hooked to a nice 3-speed Townie bike, the Ridekick followed me everywhere I went. And like a strong tailwind, it offered power to spare at the push of a button. Truth be told, I knew just what to expect, but you might not. Every Ridekick dealer is prepared to let potential customers have a free demo ride, and I suggest you take them up on it. I have ridden many E-bikes and used my own trailer enough times to envision the effects of an E-trailer. The trailer pushes the bike at the axle, similar to the way your own leg power does. There are no adverse affects of being pushed in this way. The bike tracked perfect, and even under full power, the ride was stable and secure. I rode many tight circles and zigzags with full confidence. Even with the additional weight, the braking coming down the hills was solid. The Ridekick is narrow and low, making for no worries of interference with obstacles. I found the power and speed more than sufficient. I powered up those hills with only mild pedaling needed. The acceleration was not severe, and the top speed felt like the claimed 19 MPH. The throttle button on the handlebars has a nice design and was easy to operate. It gives nice proportional control of the motor’s power. The electric assist was smooth and quiet. The total E-bike effect was easy to experience and enjoy. 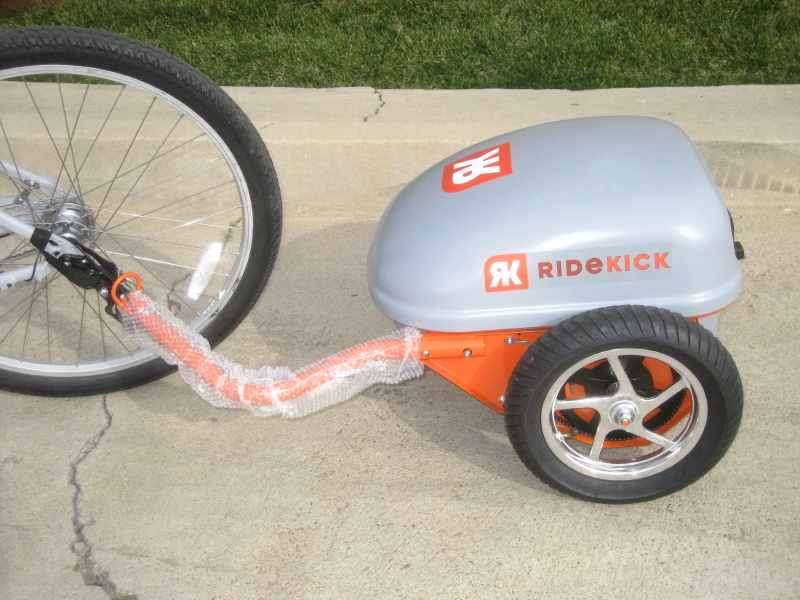 Using a 500 watt brushed motor with a chain to drive the wheel, the Ridekick has all the power-assist you should need. What we have here is a self-contained power unit. 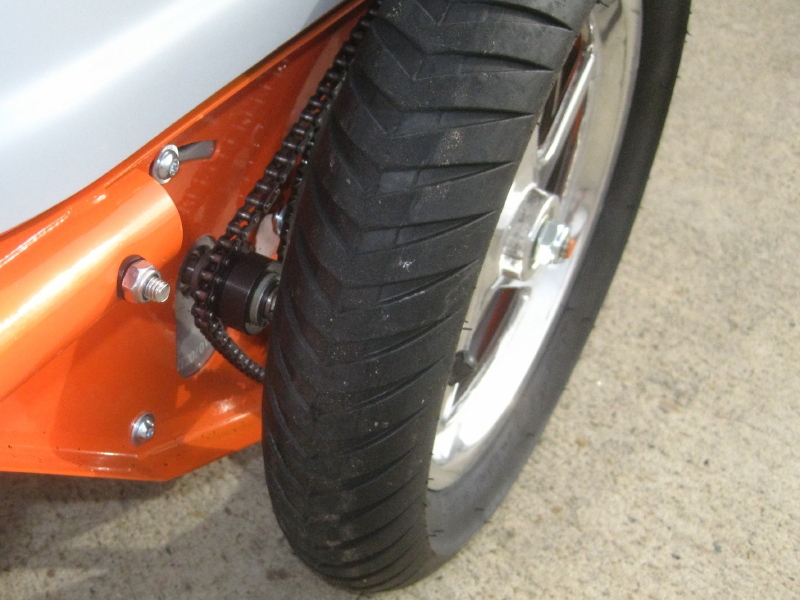 The 500 watt brushed motor drives one wheel with a chain and sprocket set-up. The 24 volt, 12 Ah SLA battery is enclosed in a nylon bag and strapped securely inside the trailer. The ECU has battery charge info and a simple on / off switch. The cover has a locking latch and room inside for groceries or other cargo. The tow arm can be disconnected to cut down on the room needed to stow in in your car, house, or garage. At 40 LBS, it is not too heavy to move or lift into your trunk. It even has a flashing tail light built-in. The installation is quick and simple. The trailer hitch is secured with the one left axle nut. The throttle unit and connecting wire hook to your bike with Velcro straps. At the trailer hitch is one connection plug and a pin that are easily disconnected when needed. Simple, strong, and smart, this Ridekick E-trailer is easy to hook-up and use for even the least mechanically-inclined rider. You could also purchase a second throttle unit and hitch so it could be used on more than one bike. There were a few things about the Ridekick that I thought could be better. One is a larger cargo area. I could easily see a larger top or a luggage rack adorning the cover. Turns out that Ridekick has had the same thoughts. They offer such things to customize it to your needs. Also, I thought the 12-15 mile range of the battery could be more. Once again, they will soon offer a Lithium battery up-grade that can almost triple the distance between recharges. I am all for that, as I have kind of given up on SLA batteries for a couple of reasons. So here I am, pedaling the Ridekick all over town. Smiling up the grades, Feeling the smooth, quiet electric assist, thinking that everyone should be so lucky. And you can. This electric-assist trailer is priced so reasonably. The ease of using it couldn’t be much simpler. The quality is easy to see and the performance is rock solid. This could be the perfect accessory for the bicycling world. If you can’t find a local dealer (which would surprise me, as they have many), this is one item I fully think an online purchase would make sense. Unlike a complete bike, there is little to go wrong with it. I am always concerned about the everyday person ordering a E-bike online, with the worry of size, feel, and potential problems. The Ridekick E-trailer is as close to maintenance free as it comes. With an occasional lubing of the chain and recharge of the battery after each use, it should prove to be a thrill that could outlast the bike it pushes. What a great product. So hit your local dealer, check the Ridekick website, and move into the world of easy cycling, Turbo Bob. “The grace and charm of the bicycle lend added warmth and contour to the persons of the lovers it joins.”—James E. Starrs, The Noiseless Tenor. This entry was posted in Bike accessories, E-bike general interest, E-bike test reviews. Bookmark the permalink. How much does it cost? And how much more will it cost for the lithium version? Sqoot, all the prices are on their website. Also many reviews and videos are there. The lithium battery option is not available yet, but it will be more. So far it seems that they will offer the lithium battery as an up-grade, but I hope they will offer the entire unit with the lithium battery so you don’t have to purchase the SLA that comes with the trailer too. A reasonable idea is to buy a second SLA battery (at a fairly low price) and keep it in the trailer in case you run the first one out of juice. It is not the best way to go, but it will help increase the total range without spending too much more. Is the RideKick noisy – either the electric motor or the wheels? Also, will pulling the trailer without power slow down the rider? Yes Mary, pulling the trailer without the motor-assist will slow you down. It is fairly heavy, but has little rolling resistance. I found it to be no worse than pulling my regular trailer when it is loaded down. So making sure you don’t venture out further than its power range is a good idea. You do have the option of purchasing a second battery to extend the range. Soon, you will be able to get the lithium battery up-grade that will double or better the range of the SLA battery it comes with. It is not noisy, but does make some sound. It is a gentle whirling sound that is kind of pleasant. It is louder than some E-bikes, but quieter than our E-Zips that have reduction gears in the motor that can be heard easily. Thanks for the question. If you get a chance to try one out, let us know how you like it. Turbo. This is a first Generation product and the pricing has been upped about $150 since inception. I can see a few things that I’d like to see changed. * A slightly larger model with 16″ or even 20″ Standard Bicycle Tires. * A 36 Volt or even 48 Volt Option (This could still be throttled by the controller to comply with Federal Law but would offer a lot more power up steeper hills with larger riders). Actually I’d like to just buy the shell and install my own motor, controller, and battery. Lithium Batteries are available now. Unless a dealer really jacks the price of the battery up there is little profit for the manufacturer which is why it makes sense to leave out the battery and let it be a dealer or end user option. I couldn’t agree with you more about not wanting to buy the Lead Acid battery. This is the “Dell” trick where they sell you a laptop with half the memory you want and only 2 upgrade slots. Lead Acid will NOT save you money as they batteries will die much sooner. I understand there is a need to have some weight in the trailer for traction which is why I believe they will offer the 13lb 20ah batter and not a 10ah battery, which in my opinion is a better choice anyways. I’d also like to see the company be more responsive to email requests. Having dealers is great, but they are few and far between outside of specific areas. Your write up is the best I’ve seen so far because no one else has bothered to talk about using the ridekick on hills even though their own website has a video going up a hill. I’m concerned with overheating the motor on steep inclines in hot weather. I hope to get my hands on one to do some real hill testing in hot weather. I do not want to intentionally try and cook the motor, but I do want to see how hot it gets and how long it will hold up. BTW: Did you purchase one or are you going to wait for Generation II? Thanks for the input, RBS. No, I did not buy a Ridekick. Just like so many of the E-bikes and bikes I test, I went to my nearest dealer for the one-over. Like you I think some refining would be nice. I do think they have done a great job on this item, at the price point they are maintaining. All your points are well taken, and the PR person (Chelsey) I talked to was quite receptive to my suggestions (same as yours). Do expect other versions with more power and range. The motor heating you expect is not a problem for the motor life, as the ECU on the Ridekick has a thermal safety shut-down built-in. I did experierence this after my third time up the nearby steep hill. I would rather wait for the electrics to cool-down, than damage a component of the E-trailer. Why don’t you give Chelsey at Ridekick a call to tell her what changes you would like to see. She is very knowledgable about their product and very receptive to input on how they can better serve us riders. That, and she seems like the nicest of people. Let us know know how that goes and what you think when you get a chance to try a Ridekick E-trailer for yourself. Thanks, Turbo.